The Professional Regulation Commission (PRC) on Thursday, November 26, 2015 has released the full list of passers for October 2015 Criminologist boad exam wherein graduates of the Philippine College of Criminology (PCC) dominated the licensure examination top 10 list. 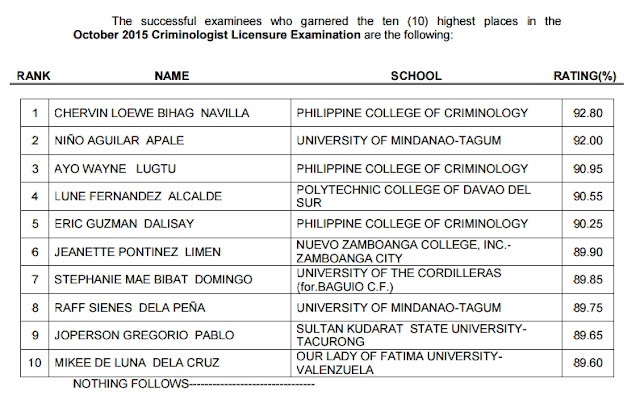 Chervin Loewe Bihag Navilla of PCC led the 9,671 out of 29,591 passers with 92.80 percent grade. A University of Mindanao (UM) - Tagum alumnus Nino Aguilar Apale placed second with 92.00 percent garde. It was followed by another graduate of PCC, Ayo Wayne Lugtu with 90.95 percent grade.